Sales is a complicated topic with lots of moving parts. Being able to make sense of those parts, and maximizing the efficiency and effectiveness of each of those parts is essential. A “Sales System” is nothing more than a way to organize the pieces of your sales engine and for a way to have thoughtful discussions on them. 1. Create Opportunities – Every business has to create opportunities. While most companies do lead generation, many don’t go far enough. Typically, “Create Opportunities” consists of inbound and outbound marketing. We take it a step further. We think that the way your sales reps interact with current and prospective customers can be a source of leads. Intelligent conversations is what this is all about. Think about it, when your reps go out to visit prospects do they understand what concerns the prospect, or do they go in and pitch? Do they probe as to what the prospect needs to do to improve their business or even survive in today’s economy? What are their goals and aspirations? Do they have a clear idea of what they are? What would they find compelling and how would they want to receive that important information? 2. Managing Opportunities – Okay, now you’ve had a great conversation and determined needs and you think there is something here. There is something you can offer that the prospect will buy from you. By definition, you now have an “opportunity”. That’s great, but what will you do with it? In the world of complex sales you can’t just wing it. Each opportunity worth pursuing requires you create a strategy and a detailed plan for closing it. This strategy takes into account your “positioning” within the account. It asks how are you positioned with: the buying influences and how and why they want to buy, relative to your competition, and relative to whether this a good deal for you or not. 3. Account Management – Almost every company we deal with will tell us that they do accountmanagement. But, when we ask them what their account management plan looks like it usually sounds like this “we ask the rep to plan out how they will grow the account by 15% next year.” This is backwards. Remember that we said that the customer is at the center of everything we do? Well, given that, the real question to ask the rep is “how will you develop the types of relationships so that they will buy 15% more next year than they did this year.” That is a key point of distinction. With the customer at the center we focus on relationships and how to develop those relationships so that we will be well positioned for when the customer is ready to buy. 1. People and organization – who are the people on our team, how are they organized, how are they measured? 2. Management execution – what is the role of the manager? How will this person manage the three main components of the sales system? How will they manage the people? How will they coach their people? 3. 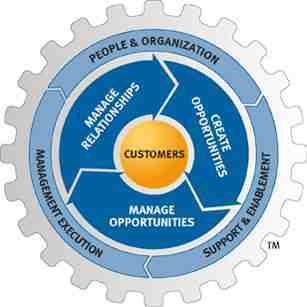 Support and enablement – what is our CRM system? How does it support the reps in the field and on the floor? How does it add value to the overall equation? The Miller Heiman Sales System is built from the best practices of the world’s best sales organizations and that’s described above. BetterSell Solutions, as a certified Miller Heiman consulting partner has helped many organizations achieve sales excellence through the implementation of this sales system.